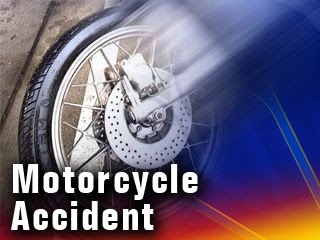 On Saturday, April 19, 2014 at 4:19 p.m., Galloway Township Police responded to a motor vehicle accident involving a motorcycle on White Horse Pike (US Route 30) in Galloway. A 2013 Harley Davidson, operated by BillyJoe Hyslop of Egg Harbor, was riding eastbound on the White Horse Pike (US Rt. 30) when the right saddlebag fell off the motorcycle and into the path of another 2013 Harley Davidson operated by James Carney of Tuckerton. Carney struck the saddlebag, lost control of his bike and was ejected from the motorcycle. Carney sustained a fractured leg and rib injuries. He was wearing a helmet. He was transported to Atlanticare Regional Medical Center City Campus by Galloway Township Ambulance with the assistance of Medics. The accident is under investigation by Galloway Ptl. Schroer.